These key lime possets couldn’t be easier to make, yet look and sound elegantly complicated. Super creamy with a refreshing lime twist. A British classic and a crowd pleaser. Today, I’m guest posting a sweet key lime posset recipe for my sweet friend and fellow sugar blogger, Allie. Allie is the owner/author/photographer behind the blog, Baking a Moment. Allie blogs about sweet baking and desserts like myself. You will often find her sneaking off to the kitchen and whipping up some of the most visually appealing desserts I’ve ever seen! Allie tends to blog things that are a little different, and can take cupboard staple ingredients and turn them into something fantastic! Let me guess, you’re probably screaming ‘what’s a posset?’ Well, a posset is kinda like a pudding. Made with rich double (heavy) cream, sugar, and the juice of a fruit — traditionally lemons. The posset mixture gets cooked gently in a saucepan until the sugar melts, this allows it to set without whisking. This key lime posset is ridiculously easy to make, immensely creamy with a refreshing tart twist from the key limes, and textured with the zest of the limes too. Why not head on over to Baking a Moment to snag this key lime posset recipe? 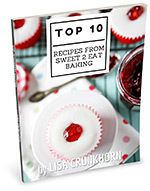 Wow, Lisa, you are another blogger that can make any dessert look fabulous – and also informative! I now know what a posset is!!! Off to check out the recipe! The post is now live at Allie’s blog, Kim. So now you’ll finally get to see what a posset is. Sorry about the mix up. i have never had a posset before! definitely on my to eat list right now, looks delicious! Thanks Thalia. Do let me know when you have a minute to try it out. This lime posset looks PHENOMENAL! I’ve been looking for a good posset recipe & cannot wait to try this version! 🙂 If you haven’t seen already, please come share you pins with us at my Tuesdays link up party! We’d love to have you!